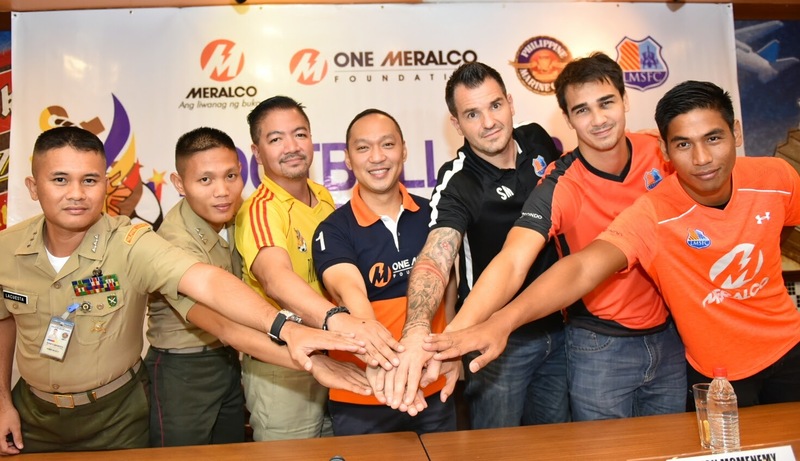 Meralco’s social development arm One Meralco Foundation and football club Loyola Meralco Sparks have teamed up once again with the Philippine Marine Corps (PMC) for the annual Football for Peace Festival happening in Metro Manila from April 23 to May 1, 2016. In photo during the sports event kick-off attended by members of the Philippine Sportswriters Association are One Meralco Foundation President Jeffrey Tarayao (center) with (from left) PMC Capt. Ryan Lacuesta, PMC Capt. Ryan Gandeza, Football for Peace co-founder Rookie Nagtalon, Loyola Meralco Sparks Coach Simon McMenemy, Team Captain James Younghusband and Goalkeeper Ricardo Padilla. The advocacy, which was started by PMC in 2011 in Sulu, utilizes football as a tool to instill peace-loving values of sportsmanship, camaraderie, teamwork and discipline in the minds of young athletes, especially those living in conflict areas in the Autonomous Region of Muslim Mindanao.